The Rafa Nadal Academy by Movistar, located in Manacor (Majorca), came into being in 2016 with the aim of becoming a benchmark centre in the world of tennis at an international level. With the driving force of the sportsman Rafa Nadal, the Academy brings together tennis and education, aiming to ensure that students may follow a career in tennis without neglecting their academic studies. The architectural project consists of more than 24,000 m2 and a range of impressive facilities located throughout the halls of residence, training school, hotel, sports courts, changing rooms, bar, clinic and green areas. David Iglesias, architect of the Rafa Nadal Academy: "The premise of this project was to build a training academy and at the same time create a building for use by the people of the town and for the whole of Mallorca. Therefore, the end result had to be made up of a very defined area, specifically for children, and another, completely the contrary, where people could circulate freely. Consequently, the two buildings that make up the final project are relatively multi-functional, each one with its own features and level of safety. They are perfectly interconnected, in such a way as to meet with the objective". 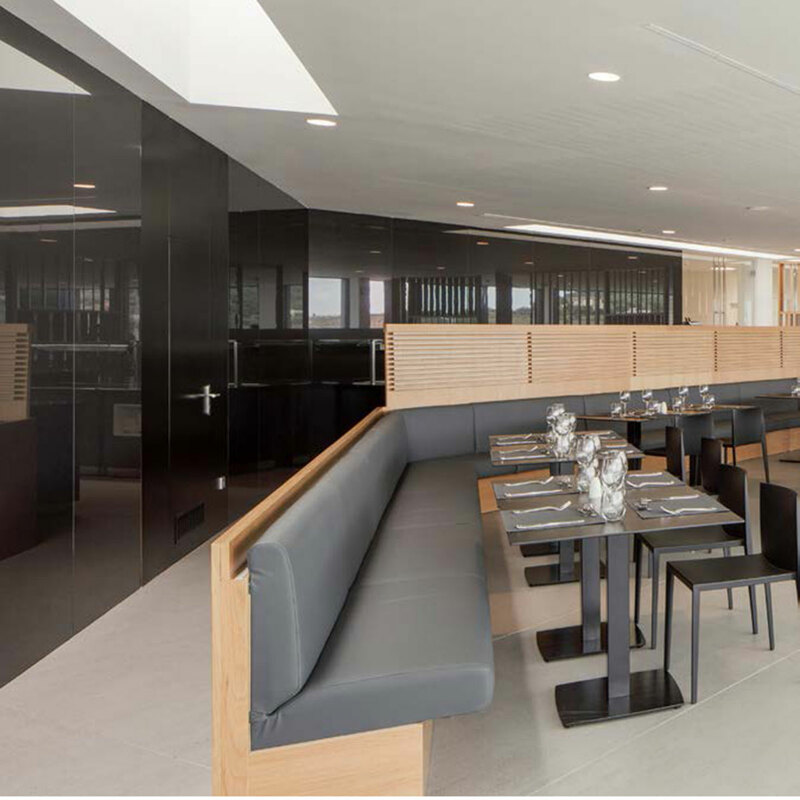 The Rafa Nadal Academy has become a real showcase for DKTN by Cosentino® and Silestone® products. 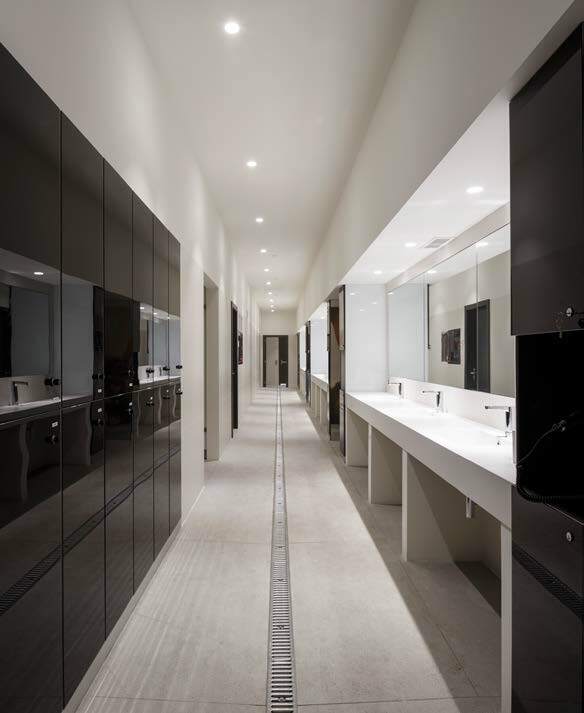 The Cosentino Group has fitted more than 40,000 m2 of DKTN by Cosentino® of all thicknesses and for different types of use, such as tiling, floors, countertops, stairs or baseboards, with particular emphasis on its use in the façades of the two main buildings of the complex, the pools and the spa area. Silestone® is in evidence in the 130 shower trays in Blanco Zeus colour with a suede finish. This very same tone and texture was also chosen for the more than 100 bathroom countertops, which incorporate Elegance hand basins from the Cosentino Bath Collection. 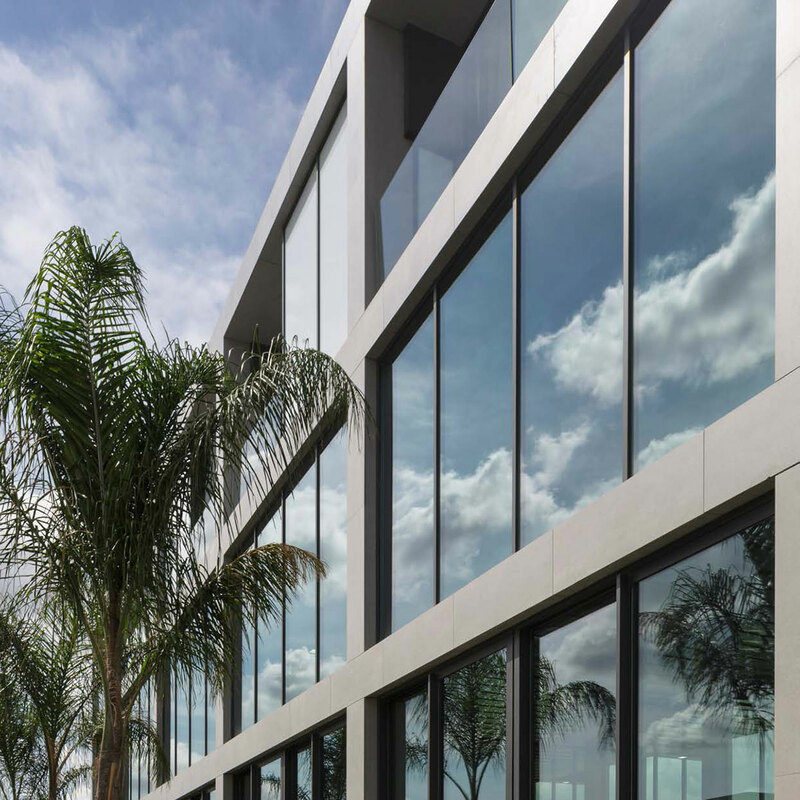 The façade of the Rafa Nadal Academy is composed mainly of DKTN by Cosentino® and glass. The qualities of DKTN by Cosentino®, such as its high resistance to ultraviolet rays, its resistance to frost and thawing, its colour stability and high stain resistance are essential properties for its use with such exterior façades. Also of importance is its ease of assembly, due to the precise nature of the material; there is an excellent ease of fusion between the CAT1 Wandegar system, used in the placement procedure, and the DKTN by Cosentino® pieces. The result is visually spectacular. David Iglesias, Architect: “The best feature of DKTN by Cosentino® is something which we architects love: its format. It allows you to play with large dimensions and with different forms of quartering. It is very easy to work with DKTN by Cosentino® and the result is perfection”. The large format of the DKTN by Cosentino® pieces allowed the creation of beautiful pavements and applications of quality and beauty in almost all environments encompassed by the project. From a functional point of view, its hardness, resistance to abrasion and its easy daily maintenance, make it the perfect product for this type of use, both indoor and outdoor. What is more, the use of anti-slip grip technology gives the material a greater level of safety, preventing possible accidents in areas of regular use, especially in those where water is an added feature, as is the case with the indoor and outdoor pools or the impressive spa that form part of the project. 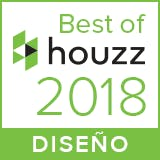 Thanks to its high resistance to hydrolysis and therefore its excellent performance in contact with water, DKTN by Cosentino® is the ideal material to give shape to all the features of the pool, such as the edges with detail, the external and internal coverings and the sanitary installations. In this regard, it is also the perfect product to cover the whole spa; in this area, the flooring is uniform with the rest of the features (swimming pool, showers, wall tiling and sauna), since, as if they all formed part of a single body, use has been made of a single colour of DKTN by Cosentino®. The sense of unity and amplitude is remarkable. DKTN by Cosentino®’s composition and aesthetics do not change, even in continuously damp or wet environments, thus ensuring its durability. 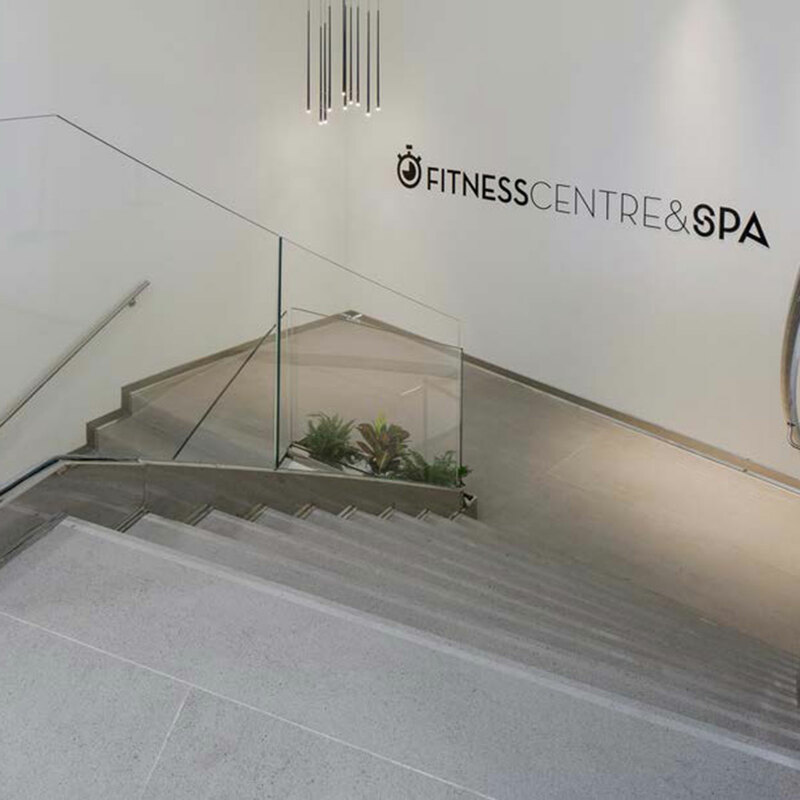 The stairs form part of the continuous flooring of the building and receive high level of footfall every day. DKTN by Cosentino® is the ideal surface for areas of high transit - it is hard-wearing thanks to its hardness and high resistance to abrasion. 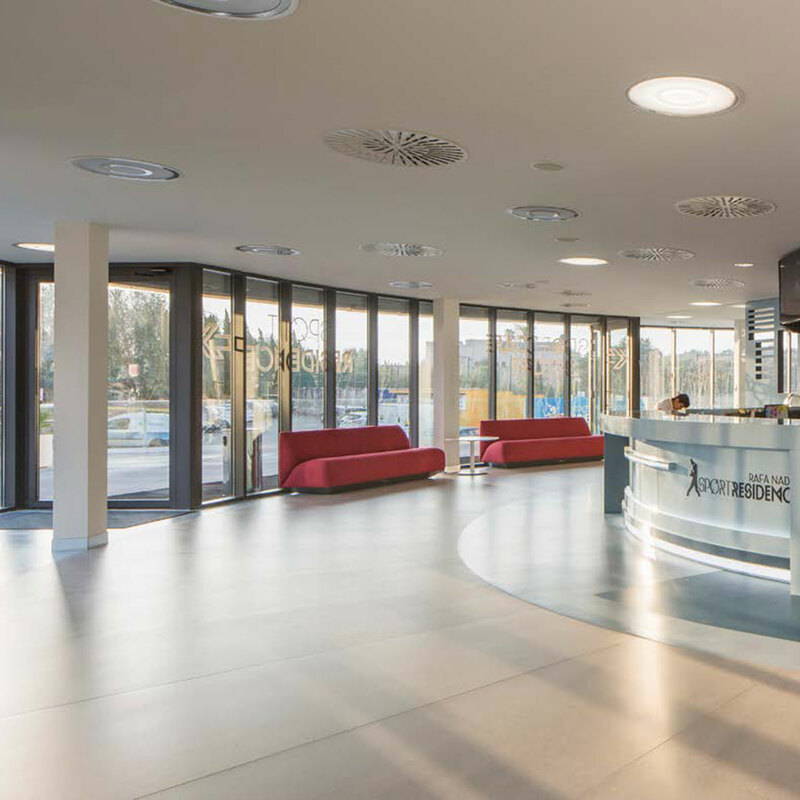 Another great advantage offered by DKTN by Cosentino® – and one which has been highly prized for this project – is the fact that the steps may be manufactured in one piece, without having to create joints in between them. COSENTINO GROUP obtains in 2016 the Environmental Product Declaration (EPD) for the Life Cycle Analysis of DKTN by Cosentino®. and energy, reducing waste generation. All the wall coverings, created from large pieces of DKTN by Cosentino®, are important players in the final grand design. The flatness of the product may be appreciated even in its 8 mm format for vertical installation, and the resulting uniformity is striking from both an architectural and an aesthetic point of view. 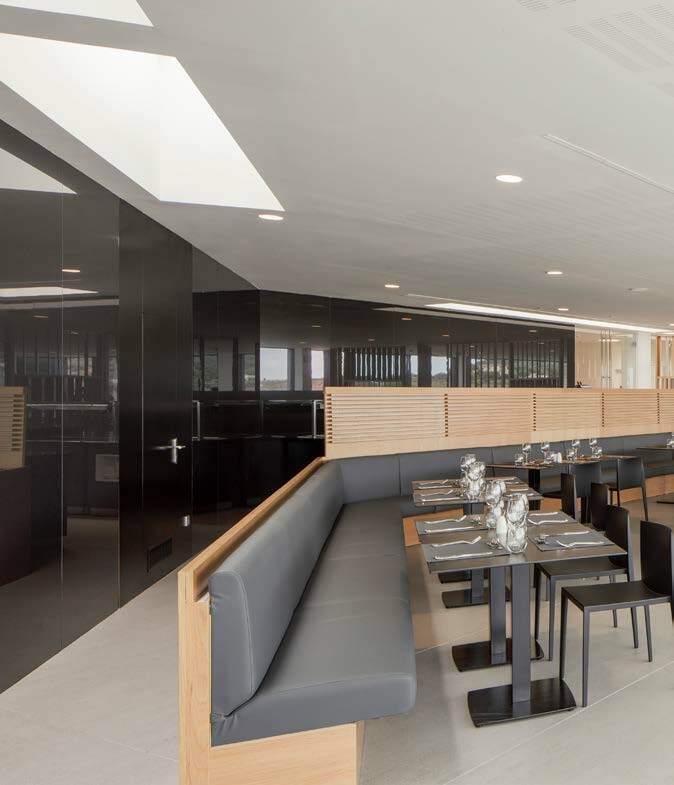 This environment highlights how the large format of DKTN by Cosentino® facilitates its adaptation to the creativity and the versatility of any architectural project. 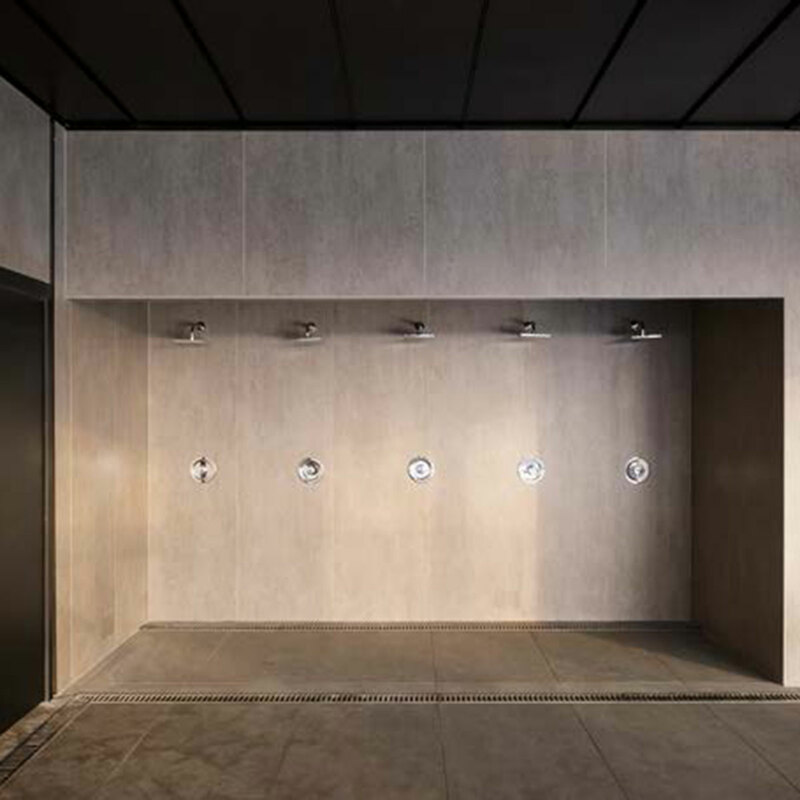 Whole walls of DKTN by Cosentino® may be seen in use in the areas of changing rooms, spa, indoor pools, restaurant, bathrooms and bedrooms, both in the student halls of residence as well as the hotel. A harmonious atmosphere and spectacular visual effect go hand in hand along with exemplary hygiene thanks to the considerable reduction in the number of joints between the pieces. DKTN by Cosentino® is ideal for any bathroom coverings due to its excellent water resistant qualities. Thanks to its high resistance to hydrolysis, this material does not change if it is in contact with fluid for prolonged periods of time. This fact, which ensures the durability of the material, combined with the ease of its daily maintenance, have made this the perfect choice to cover all the showers of the spa and those located in the changing rooms and the halls of residence. For this project, two customised shades of DKTN by Cosentino® were created: an intense blue which serves as a hallmark of the academy and its image to the world, thanks to its use in the main façade, and a soft white tone (Alba) that is characterized by its subtlety and which covers a great number of the walls of the building. 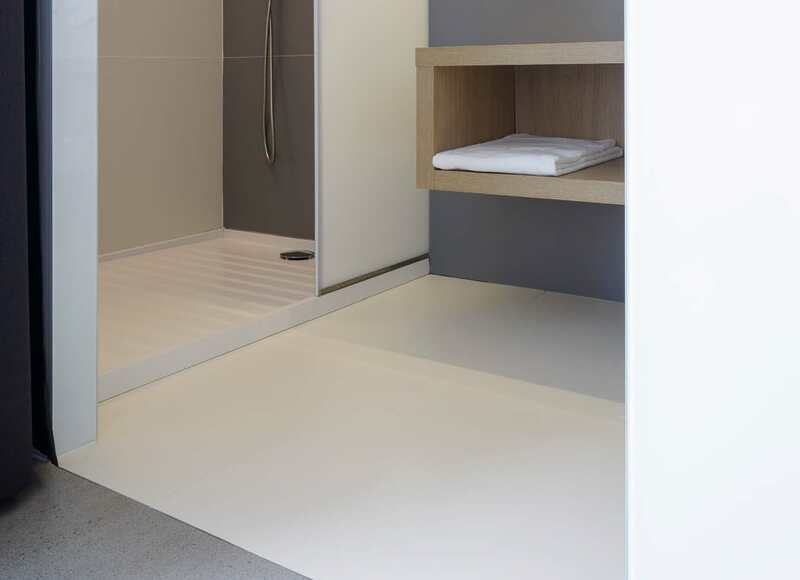 For the bathrooms of the halls of residence over 130 shower trays with a Silestone® quartz surface have been created. The model chosen, due to its attractive and elegant design, was the Kador Series of the Cosentino Bath Collection. The purity of colour of Blanco Zeus and the sensuality of the Silestone® suede finish provide an effect which is extraordinary both aesthetically and visually. The safety aspect is crucial in this type of use. This aspect is fully met by Silestone® shower trays, which have an established low slipping risk, meeting with the strict German standard DIN 51097: 1992. Its low porosity and minimal maintenance requirements make Silestone® the ideal product for this type of use, where water and other personal hygiene products come into play. 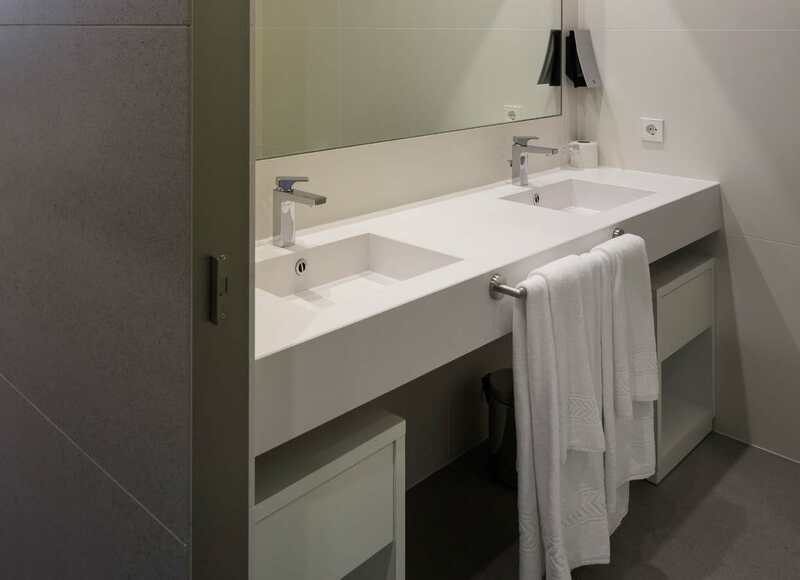 The possibilities of format and size offered by Silestone® in all its bathroom collection has allowed the creation of over 100 customised bathrooms countertops for the halls of residence. In order to continue to offer the sense of unity that characterizes the whole project, countertops were created with integrated wash basins from the Cosentino Bath Collection. The Elegance model and its outstanding design, with its straight, highly defined lines, lend the space a unique beauty. The countertops with integrated wash basins provide the design, style and high performance features of Silestone®: hardness, high resistance to staining and scratching and low liquid absorption.